The glue that kept VSAUW together this past year, Leah Dao deserves to be recognized as “Member of the Year.” In the last three years, she grew a lot from her position as Freshman Media Intern to Secretary, and then President. During the 2017-2018 officer term, Leah was the only returning executive board member from the previous term. In addition to learning her own individual roles, she also had to focus on developing the leadership skills of the new members of executive board and general officers. She has done more than what her role asks for and never expects anything in return. 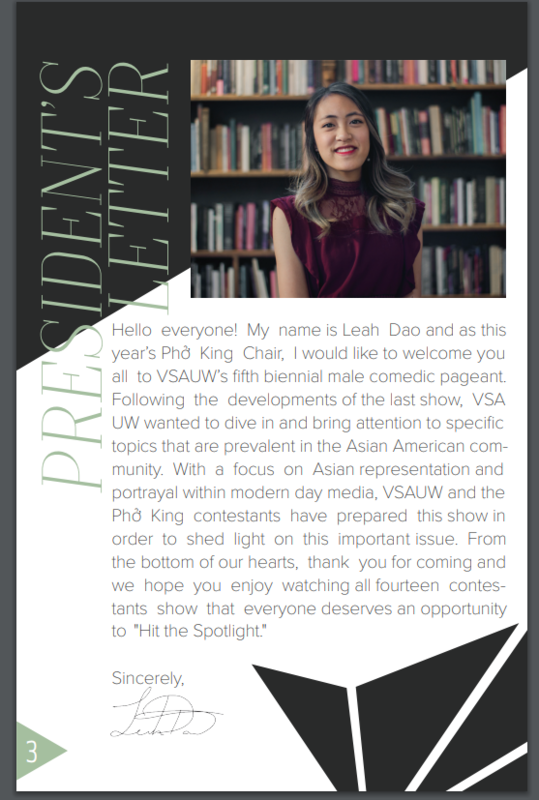 In addition to being President, which is a hefty role already as it is, Leah decided to take on the role as Phở King chair this year for our biennial male comedic pageant. She had to work with thirteen male contestants for twelve weeks and planned this three-hour event for eleven months. Phở King is VSAUW’s biggest event of the year, and without Leah, it would have been inconceivable. This event is so much more to VSAUW and the community than a comedic pageant. Leah came into her role as PK chair with a goal: To use this platform as a way to raise awareness for the lack of (good) Asian representation in the media. While it was already difficult to spearhead a pageant, it is even more taxing to make that event meaningful and something that will be remembered in the years to come. We choose to nominate Leah not just because she is our President, but because she is someone that has altered the course of VSA. She is the manifestation of past years’ experience and the ambition for the years to come. With Leah, it is not simply enough for VSAUW to continue doing its role, but it must expand and become even more. She is irreplaceable and utterly outstanding in all her roles. For these reason, we have chosen to nominate her to be Member of the Year. Leah is a woman with many hats. She is not only the President of VSAUW, but a staff member for UNAVSA-15, the Vice President of Administration for her youth group, and another UW club’s Videographer. Yet for Leah, being a part of so many different organizations was never a weakness, they were all lessons to be learned, wisdom to be disseminated with VSAUW’s own officer team. 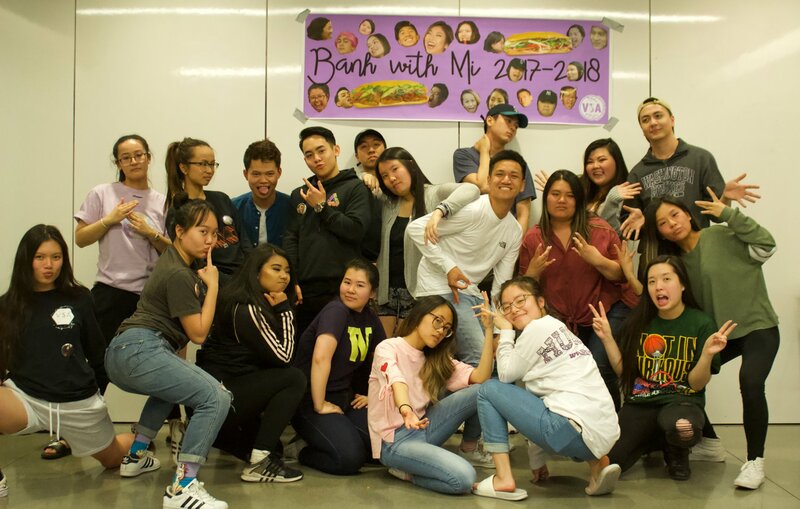 As Videographer for UW’s premier Kpop cover group The Kompany, Leah was able to use her extensive knowledge in video production to help Media Team with various projects including the introduction video for Pho King 2018. As a staff member for UNAVSA-15, Leah has been generous with VSAUW in teaching our team about UNAVSA’s mission and bringing in the best parts of UNAVSA’s strategies for outreach and leadership. Under Leah’s presidency, the officer team not only were able to learn from within the UW environment, but also from the community around it and other VSAs in North America. Leah brings to VSAUW many perspectives, something that is invaluable as we further our pillars of empowerment, inclusivity, growth. Because of all her involvements, Leah is extremely adept at resolving conflicts and public speaking. This proved crucial in the Pho King production process, as she had to regularly answer questions from the contestants and officers. These three months were trying, but Leah was able to help everyone involved move through the difficulties. 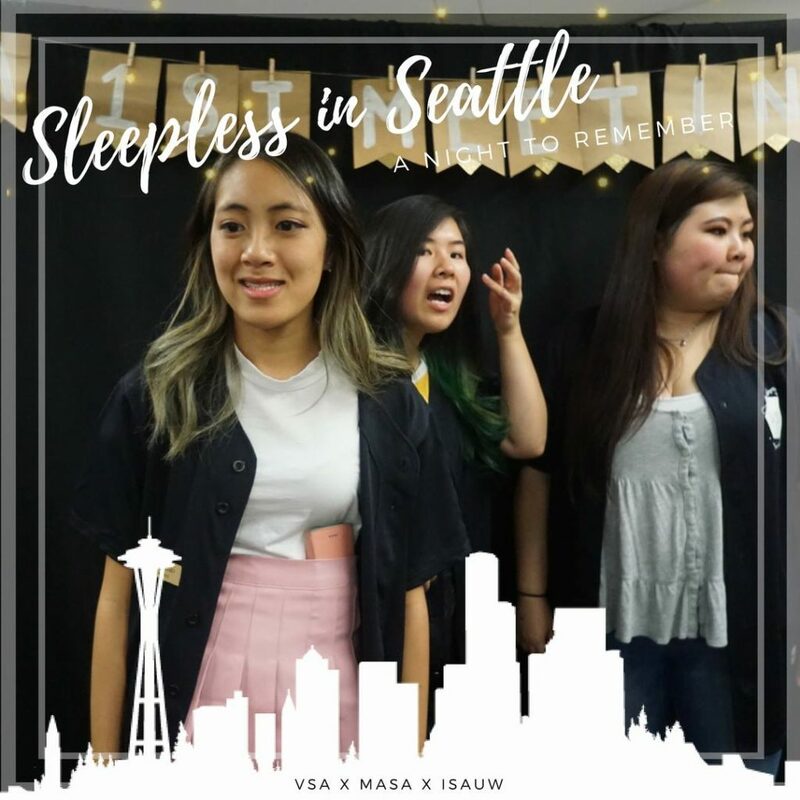 With Leah in the President’s seat, VSAUW truly moved farther than it has in past years to become a flagship for the Vietnamese community on campus and around the Seattle area. With her involvement in these different organizations, Leah stands as a woman who is inspires and empowers everyone that she works with. Each organization has something different to offer, and Leah takes what she learns to further develop growth within individuals of VSAUW. She brings out the best in everyone she works with. Even as the president of VSAUW, Leah is not the stereotypical kind of “presidential” that one would imagine in a politician. She is, instead, so much better. Unlike the kind of leader that would sit back and let their subordinates do the heavy lifting, Leah treats all members of the VSAUW officer team and the members as friends. She is humble, selfless, and supportive. Leah has a strong ethical core, one that allows for her to be both firm and empathetic to her team. Whenever anyone on the team is facing a difficulty, Leah will help them to solve it themselves. A good friend will want to solve these problems for you, but Leah is a great friend, one that will guide you in hopes of helping you to grow as a person. Though she is not flashy or in-your-face about her presidency, Leah still exudes likeability and charisma, traits that have motivated members to come back to meetings more than once. Even during her lowest, Leah is still thinking about the club and the members before she thinks about herself. Examples of this can be found throughout the year, but the most memorable is during the week before our culture show. Each of the show’s committees ran into problem after problem, but Leah was our rock, holding us accountable until the very end. In the end, it was because of Leah that we were able to put on Pho King 2018, and this fact can be attested to by everyone on the officer team. Outside of VSA, Leah is involved heavily in Thieu Nhi Thanh The, a responsibility that has helped her to further the breadth of her personality. Though busy, Leah never neglected any of her duties. She is willing to sacrifice her own time for the sake of the organization and the sake of others. There is no better person to turn to in hardship, and there is no better person with whom you can celebrate your triumph. Leah Dao exemplifies the best that VSAUW has to offer.